Will There Be an End to Saudi and Turkish Provocations in Syria? It’s all started with the Arab version of CNN releasing information that Saudi Arabia has begun preparations for the invasion of Syria, to achieve the “utter and complete destruction of ISIL”. It was said that a 150,000 strong expeditionary force of Arab and Islamic countries including Egypt, Sudan, Jordan , the United Arab Emirates, Qatar, Morocco, Bahrain, Indonesia and Malaysia. This statement was made against a background of a comparable number of Turkish troops being concentrated near Syria’s northern border, supported by tanks, armored vehicles and helicopters. Ankara has already voiced calls to stop accepting refugees from Syria, and instead, creating a “security zone” inside Syria to house them. Apparently, Ankara is going to spend European money on that project, while surrounding the area with heavily armed Turkish troops. Therefore, we are witnessing a desperate attempt to create a military presence in northern Syria at least semi-legal, since Syrian troops and the supporting people’s militia have almost managed to seal border with Turkey for good, thereby cutting off the main supply route of various militants that are fighting against the legitimate Syrian government and stealing oil from it at the same time smuggling it back to Turkey. Riyadh has already made similar declarations of this kind before, but now London has become heavily engaged in this game as well. The Daily Telegraph announced that the British Armed Forces are going to deploy a large number of troops and heavy vehicles in Jordan for military exercises. This way, London is trying to test its ability to send up to 30,000 soldiers to virtually any part of the world, in the event of a possible conflict between Russia and NATO. As part of the military exercises code named “Shamal Storm,” the UK will deploy 1,600 soldiers and 300 vehicles to Jordan, to carry out drills similar to preparations for the invasion of Iraq. According to British journalists, London hasn’t carried out such drills for over 10 years. The newspaper is citing an unnamed military expert who explains that these military exercises have nothing to do with the fight against ISIL, and instead, London is merely preparing to support the United States in a military engagement in Ukraine. The anonymous source added that “Shamal Storm” can be seen as preparation for the possible conflict between Russia and NATO, which is difficult, if not impossible to believe. After all, a possible conflict between NATO and Russia in Europe – would mean full-scale nuclear war, but not the trench warfare of the First World War. On top of that, the United States has never announced that it would send its troops to Ukraine to launch an assault on Russia from this direction. Apparently, this kind of cheap propaganda is becoming the norm for the Western media, even for those journals and newspapers that were once considered credible. As for the Arabs, it’s all fairly clear. What kind of an expeditionary force are we taking about? The Saudis, Emiratis, Qataris, and Kuwaitis are all currently mired in Yemen and have been so for a long time, unable to overwhelm local Shia rebels – the Houthis. As for Saudi air power, it appears only capable of carpet bombing urban areas, killing civilians in droves. And it must be remembered that Saudi threats are being fed to the international community all while Saudi Arabia itself faces a potential Shia rebellion in the Eastern Province, and when tribal leaders are prepared to oust the Al Saud clan due to their policy of dropping oil prices. Apparently, Riyadh’s threats are aimed at stopping Russian military operations aimed at terrorists in Syria – operations so successful that Syrian government troops are recapturing a handful of settlements a day, while radical militants are fleeing to Iraq or Europe via Turkey. However, it’s quite a different story with Ankara who has been suffering one crushing defeat after another both on military and diplomatic fronts across the Middle East. After doing all it could to disrupt the Geneva talks, Turkey is now suffering disastrous consequences in northern Syria. Radical Islamists that Turkey has been supplying are leaving their positions in the Aleppo Governorate. As for Ankara’s “fellow-Turkomans” in the Latakia Governorate, they have decided to defy Turkey and side with its opponents. This basically means that Erdogan’s dreams of creating “one Turkish nation” stretching from the Syria’s Latakia to Iraq’s Ninewa are basically dead. Turkey still has a number of strategic priorities in Syria that forces Ankara to prepare for military operations in Syrian territory. It wants to maintain a stable supply channel to provide rebel groups with arms and reinforcements, along with achieving the neutralization of the military activity of Syrian Kurds to the west of the Euphrates, but at the same time achieve the suppression of activities in Turkey itself. Before Russia’s troops moved into Syria, Anakra still had hopes to create a 98 kilometers wide “buffer zone” stretching from Jarabulus to Azaz. But now, with Russia’s S-400 being deployed in Syria it is more or less off the table. The only option it has left is a direct military intervention in Syria, but NATO has imposed upon Ankara the condition that this should be planned in close cooperation with Western experts, no longer giving Turkey a free hand. Typically, even Saudi representatives are forced to travel to NATO headquarters in Brussels to discuss its possible actions in Syria. The front line in northern Syria is rapidly approaching the Turkish border. There is a growing risk of direct military confrontation between the rapidly advancing Syrian army, the Iranian and Iraqi volunteer fighters and members of the Lebanese Hezbollah with Turkish regular troops, should the latter receive an order to start an invasion of Syria. According to some reports, there’s more than 500 Turkish special force operatives deployed in Syria, who are operating under the guise of “trainers” and “advisers”. 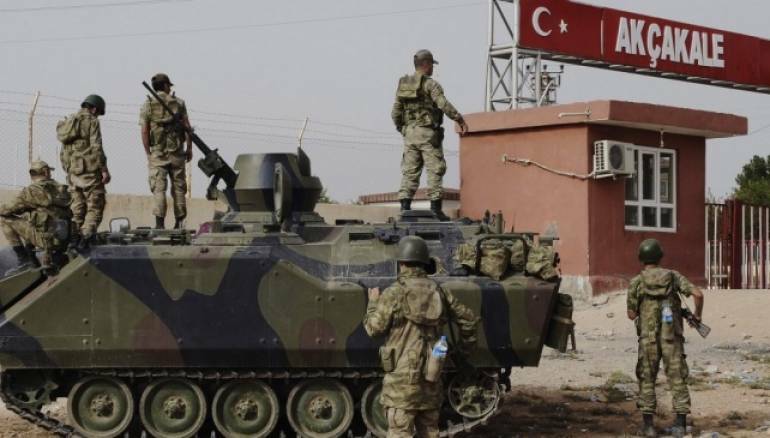 Turkey’s General Staff hasn’t had the determination to send more troops due to pressure that Syria’s government forces are applying on the militants in the Aleppo Governorate. Their lines of defense are starting to fall apart, therefore government troops have taken control of the highway running from Aleppo to the Syrian city of Azaz on the very border with Turkey. The Syrian army has relieved the villages of of Nubol and Zahraa that were besieged by militants for several years. The general offensive is being carried on with strong support provided by Russian and Syrian aircraft. In the meantime, Washington has only been making promises, for example, it announced that it’s going to send EA-18 Growler warplanes that are reported to possess “advanced electronics-jamming capabilities” to an air base in Turkey to try to counter Russia’s S-400 systems deployed in Syria, while Turkish authorities have been desperately trying to meddle with the situation on the ground in Syria. For instance, Turkish long-range artillery units have been shelling mountainous areas in Latakia. Near the fighting in Aleppo, Turkey is pulling together its armored forces to create a sort of armored fist that should overwhelm opposing forces. 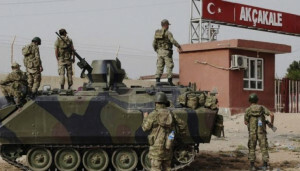 Turkey has been redeploying its heavy units from the border with Greece to the border areas with Syria. But it’s clear that Moscow has finally tired of all the “tricks” that Arabs, Turkey and NATO have been playing. On February 8, at 5 AM in the morning, Russia’s Southern Military District was raised on alert to check the readiness of its troops for combat. Special attention was paid to the readiness of airborne troops and military transport aircraft, the Black Sea Fleet and the Caspian Flotilla, in accordance with the decision of Russia’s Supreme Commander. Russian Minister of Defence Sergey Shoygu supervised the training of Fourth Army’s air force and air defense units personally The minister said that the inspection was required to evaluate the readiness of the Southern Military District to respond to any sort of crisis and check the readiness of aviation and air defense forces to repel enemy air attacks and protect important Russia’s military and government facilities. This was a clear signal to all those not willing to cease provocations and eager to embark on a military adventure in Syria. It is a signal that Russia has enough forces and resources to repel any aggressors. It’s clear that those forces should think twice before making any sort of provocation in vain hopes that the US will be protecting them.